With Dwell, in the span of one almost 20 min long track, North Americans Suffering Hour will deliver one hell of a roller coaster ride and at the same time dispel all notions (or mis-notions) of blackened death thrash metal you may have had. Because the last thing Dwell can be called is primitive, or overstaying its welcome in its unexpectedly long duration. 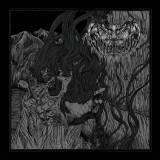 The EP gets open with expansive distortion and stately doom, for almost 4 min. I could surely handle that and it helped to get into the mood. Spasmodically, bestial deathly thrash emerges with bottomless vocals and barbwire thorny hooks dispersed throughout. I could handle that even better, while contemplating where Suffering Hour is going to take it from here. Hurricane (or blizzard, depending if you are more into water or wintery natural disasters) of disorienting riffs takes over, rising and falling alternatively, until choppy thrash is back around 10.5 min mark. The angular bent notes after that will confuse even more so you will be begging for that simpler foot tapping rhythms and catchiness. Triumphant, up in the sky, cacophony crushes spectacularly in the end, and drilling melody fades it all away. I have listened to Dwell probably 4-5 times by now and uncovered more melodies and layers still. The EP has numerous corners to explore. Serpentine and epic, the track seemingly has no end, and, interestingly enough, you donâ€™t want it to end either.